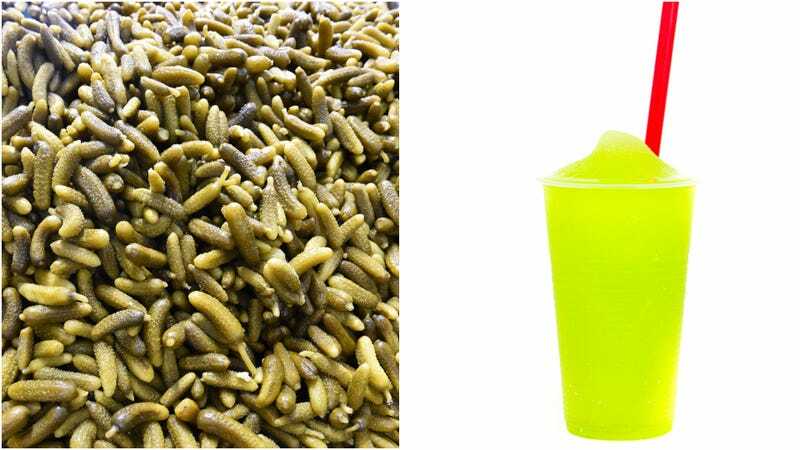 You will also be able to combine the pickle option with existing Sonic slushie flavors. We assume that that “blast of pickle flavor” has to be pretty palatable, otherwise why else would Sonic be pushing pickle slushies? So we may be open to combining the two green flavors of pickles and green apple. Or maybe a swamp-like concoction of pickle and grape. Or an invigorating beverage like pickle and Powerade Mountain Berry Blast. Also, our latest Hangover Helper reports that pickle juice is a worthy hangover cure, so that could come in handy. WFLD continues, “Once the drink hits Sonic locations, you can use the pickle-flavored syrup for anything on the menu. That means you could put it in milkshakes, sundaes, or even on burgers, as long as you’re okay with possibly paying an extra charge.” Milkshakes? Sundaes? We’re trying to keep an open mind here, Sonic, but there are limits.